SUSPENSE SISTERS: INTRODUCING ELLEN KENNEDY! It's my privilege to introduce the newest member of the Suspense Sisters - Ellen Kennedy! Ellen and I have been friends a long time. We met when we both signed with a small publisher many years ago. Although that situation didn't turn out the way we'd hoped, we both got something much better. (In my opinion, anyway!) We bonded through that experience and kept in touch down through the years. I've been her fan for a long, long time and am thrilled to finally see her wonderful books available for YOU to read. She's the Queen of Cozies, and you will love her writing almost as much as you love her. SUSPENSE SISTERS: Hello, Ellen. Welcome to the Suspense Sisters. Here, have a cookie. How do you take your coffee? E.E. KENNEDY: Mmpgh. Thank you! Lots of hazelnut creamer, please. I am just so delighted and honored to be here. SS: We’d love to learn a little more about you. For instance, how did you get into writing mysteries? EEK: Well, to be honest, I never expected to become a writer. I originally wanted to star in Broadway musicals, but it turns out that I get my feelings hurt too easily, and couldn’t take the rejection involved. So I got into advertising instead. It was as close as I dared to get to show business. And it only required an attention span of :30 to :60 seconds. SS: And when did you start writing novels? EEK: Well first, I got married and spent a couple of decades hand-raising our two daughters. They’ve turned out really well, in my opinion. Of course, I may be prejudiced, but they are exceptionally intelligent, lovely girls. They’re both grown up now, with children of their own. We have five grandchildren, adorable babies. I have pictures. Wanna see? Here! SS: Yes, thank you, they’re very sweet. I can see the resemblance. Um, getting back to writing. How about this: when did you write your first mystery? “Even I,” I snarled, “could write a better book than that!” That’s what I said, right out loud. It took a while before I actually got a story pulled together, though. SS: You had a few false starts? EEK: (laughing) You better believe it! I wrote a few pages about a housewife who decided to moonlight as a detective, but I had no idea where to go from there. Did she need a license? Or didn’t she? Too complicated. And then I wrote quite a lot on a story about a college student whose roommate steals his work and murders him. It was set at my alma mater. But that very same plot turned up on Lifetime Movies, so I dropped it. (Had a nice title, too: The Thing With Feathers, after the Emily Dickensen poem? Ah, well.) Then I remembered Alfred Hitchcock and how his best movies seemed to involve nice, ordinary people thrown into extraordinary circumstances. So I created Amelia Prentice, schoolteacher, and had her trip over a body in the safest place I could think of, the public library. SS: Did the name Amelia have any particular significance for you? SS: All right. Um, you set your series in the Adirondack region. Is there significance in that? EEK: Yes. I grew up there. SS: I see. Okay, tell me about your titles. EEK: Oh, we had fun with those! My sister had actually once been an English teacher and we got together and started batting ideas around. Ever since then, my husband and I try to come up with funny titles related to teaching English. I think a title is very important in catching a potential reader’s eye, don’t you? SS: Definitely. What are some of your upcoming titles? 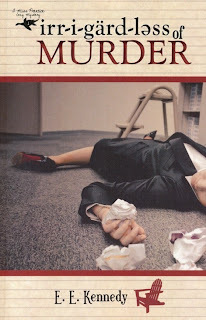 EEK: Well, you’ve seen the ones I already have: Irregardless of Murder—that’s the first Miss Prentice mystery. 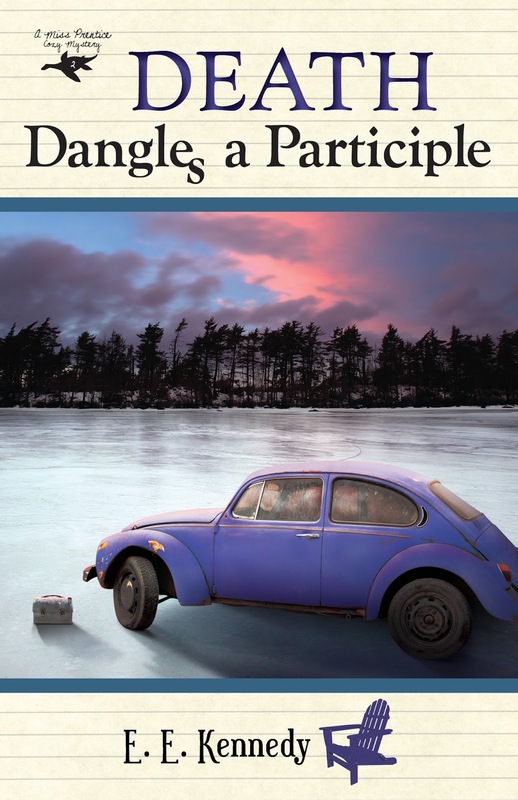 Then, there’s number two, Death Dangles a Participle. I just finished the unedited, raw version of number three: Murder in the Past Tense, which isn’t as funny a title, but directly pertains to the story. I had toyed with calling it The Comma Splice of Death, but my publisher liked the other name better. We like to kick around title ideas on long car trips. Here are a few more we came up with that I may or may not use: The Village Idiom; Murder, As It Were; Ending With a Preposition; The Revenge of the Apostrophe Police; Stranger Than Diction; To Viciously Split an Infinitive and Cursive, Foiled Again! I love titles! SS: I can see that! Perhaps your advertising background helps in this. EEK: I think so, now that you mention it. You know, all those slogans and things. There’s a downside to having written ads, though. We were required to be concise, and sometimes I’ll tell a story so concisely, it’s not really a full novel. My most recently-written novel, Murder in the Past Tense, is a very complex story, with many intertwining sub-plots, but it still kept coming up short in the number of words department. I will probably have to add a few more scenes to it to give it a satisfying length. SS: Well, Ellen, it’s been really pleasant getting to know you a little better. Have you anything you’d like to add to your comments? EEK: Yes. These are just about the best cookies I ever put in my mouth. Is there any chance I could get the recipe? Ellen is giving away a copy of Irregardless of Murder Death Dangles a Participle. For a chance to win, leave a comment, along with your contact information. Hi Ellen, welcome to the group. Loved getting to know you a bit better! Blessings on your writing and all you do. It's a blessing to be a part of this group! Thank you, Lynette. It's a real privilege to be a part of it! Thank you, Lynette! Oops! I thought the first one didn't go thru, so I tried again. Ah, the joys of technology! I surely hope you do, but if not, check at the public library. A number of them carry the book, or you could request it. Or, it's available on nook, kindle or ibook. I love Nancy Mehl, so if Ellen is your friend, I consider her mine too! The interview is great and the books sound delightful. I would love to win. The beauty of this group is that I am making more good friends. Nancy is such a fine person and she's my role model in writing, too! I'm looking forward to reading Ellen's books. Thanks for entering me in the giveaway. Thank you! I LOVED reading your interview. Your books sound really good and I will definitely look them up now. I would be thrilled to win. Thanks, Juli. It was fun writing the interview. I tend to get the giggles in grownup-type situations, and my writing reflects it. I like to think they are, Pen, but then I couldn't be objective, could I? Thanks for the kind words! I have fun writing the books, Donna. Murder is a serious business, but the silliness just seems to sneak in there sometimes. I enjoyed getting to know the newest of the Suspense Sisters! Please enter me into the contest to win the book. Martha T. at CRPrairie1 at imonmail dot com. All the Suspense Sisterses (?) books are great! You will be entered, Martha! I love this interview! I haven't read your books, but it sounds like I would like them. I loved your interview and your sense of humor. Your books sound like some that I would enjoy. Thanks you for giving me a chance to win a copy. If you write anything like your interview I can't wait to read one of your books. There's a murder in them, but otherwise they're quite jolly. What a DELIGHTFUL interview! I can't wait to read more from Ellen Kennedy and would be thrilled to win!! Thank you for this opportunity. I'm so glad you enjoyed the interview. I can never be serious for very long. I enjoyed reading your interview!! I'd love for chance to win a copy of your books!! Very kind of you, Sarah. And by the way, thanks for proving you're not a robot. That is the weirdest thing, n'est pas? Enjoyed your wonderful interview, Ellen!! Welcome!! Book sounds great! Would love to win! Please enter me in the giveaway! Thank you!! www.missprenticecozymystery.com for some free sample chapters and other fun. Loved your interview & would love to win a copy of your book! Thanks for the giveaway opportunity! Welcome to the blog, Ellen! Wonderful interview, and I'm heading off to Amazon right after this note. Love your sense of humor! Thank you, Roxanne. It's a treat to find somebody who gets one's humor. I'll have to admit, mine is a rather gentle form of suspense, but it gears up a bit towards the end. The books sound good. Cozy mysteries are my absolute favorite type of book. I like coffee with flavored creamer, too. That's the only way I take it (other than Starbucks' mocha or Bob Evans' Cappuccino). I like the powdered kind such as chocolate, hazelnut, and other flavors. We should get together for coffee, Mickey! I've just found some 8 O'Clock brand coffee in chocolate-mint flavor. YUM! I love cozy mysteries and especially stories involving ordinary people in extraordinary circumstances. Don't we all want a little excitement in our life? I am always amazed at how authors got their start. Ellen, I couldn't be more delighted that you decided you could do better than what you had been reading. It's been a humbling experience, Kelly. I may think I write better than the author of the book that I threw, but there are scads of really good writers out there. I've been able to meet many of them through this author experience, online, conferences, etc. 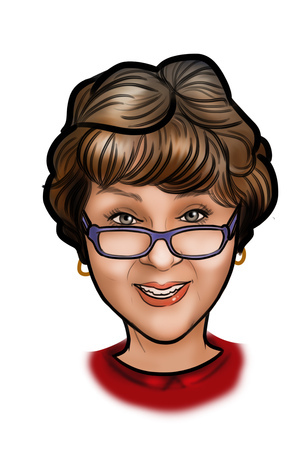 Hope you enjoy the Miss Prentice mysteries! Well, I commented here after seeing Nancy had it on FB. But don't see it now. Must have just disappeared. Oh well. Will try again and hope not too late. I liked the interview and love murder mysteries, so would love to win Ellen's book. Thanks for the give-away. Please enter my name. You were entered, Maxie, but someone else won. If you ask for it at your local library or bookstore, they can definitely order it for you. It's also on Amazon, B&N, CBD, etc. RULES FOR WRITING DETECTIVE FICTION???? ?